Unleash electricity with BMW eDrive. After the exciting appearance of BMW vehicles in the movie Mission Impossible: Ghost Protocol in December 2011.But the i concept got much fame then the movie .Now BMW i proudly introduces the BMW i8 Concept Spyder. The combination of intelligent, lightweight design and cutting edge BMW eDrive technology imbues this new model with genuine sports car performance, yet its fuel consumption is no greater than that of a small car. It'll be unveiled at this year's Beijing auto show later this month and is, as you'd imagine, a pretty good sign that Munich's going to give us a drop-top to join the i8 coupe. For those hard of memory, that's the 250kph, 42.5kpl sportster due to land in showrooms come 2014. The i8 Spyder concept is a little stinted compared to its coupe brother, though. Under the two-section folding roof it's slightly shorter and there's a more compact wheelbase, suggesting its original proportions - based on the splendid Vision EffecientDynamics supercar of 2009 - have been rethunk. 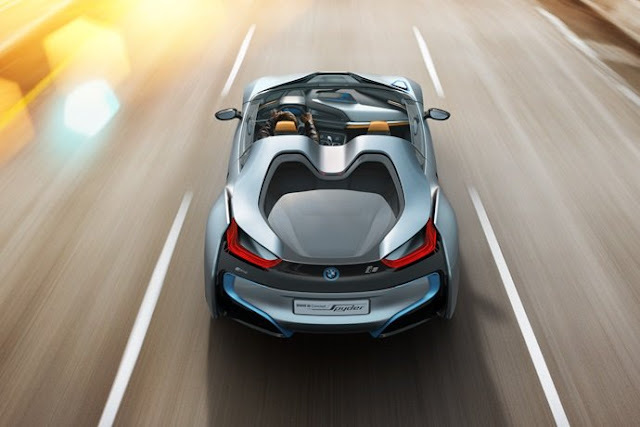 The BMW i8 Concept Spyder is powered by the groundbreaking BMW eDrive technology, consisting of an agile BMW electric motor, innovative battery technology and an intelligent engine management system, coupled with a TwinPower Turbo combustion engine. In a show of unmatched coordination – and due to the car's minimised weight – this two-seated, open-top sports car reaches a combined system output of up to 260 kW (354 hp) while using no more than 3 litres of fuel at 100 km*. The i8 Concept combines the advantages of two different drive systems. As a plug-in hybrid it reaps the benefits of an electric motor and an internal combustion engine for maximum efficiency with maximum dynamics. At the front axle is the electric motor adopted from the BMW i3 Concept and modified for use in the BMW i8 Concept's hybrid power train, while a 164 kW/220 hp turbocharged three-cylinder petrol engine developing up to 300 Nm (221 lb-ft) of torque drives the rear axle. Together, the two drive units take the vehicle to a governed top speed of 250 km/h (155 mph). Like the electric motor, the 1.5-litre three-cylinder petrol engine was developed entirely in-house by the BMW Group and represents the latest state of the art in conventional engine design. Acceleration of 0 to 100 km/h (62 mph) in under five seconds combined with fuel consumption in the European cycle of under three litres per 100 kilometres (approx. 94 mpg imp) are figures currently beyond the capability of any vehicle powered by a combustion engine of comparable performance. Depending on charging habits and the nature of the route, it is even possible to improve on these figures. Laser Light. Leading the way to the future. The BMW i8 Concept is not only fast and extremely fuel efficient, it also leads the way in innovative vehicle light technology.. For the first time BMW introduces as part of the BMW i8 Concept the newly developed Laser Light. Headlights that are more efficient than LED lights, highly flexible, ten times smaller, pleasant to the eye and absolutely safe. By definition, laser lighting is radically different from sunlight, and also from the various types of artificial lighting in common use today. Laser lighting is monochromatic and it is also a "coherent" light source. As a result, laser lighting can produce a near-parallel beam with an intensity a thousand times greater than that of conventional LEDs. Also, the high inherent efficiency of laser lighting means that laser headlights have less than half the energy consumption of LED headlights. Simply put, laser make the BMW i8 Concept even more efficient. A further feature of laser technology, which has important implications, is the size of the individual diodes. This opens up all sorts of new possibilities when integrating the light source into the vehicle. These size advantages could be used to reduce the depth of the headlight unit, and so open up new possibilities for headlight positioning and body styling. There are, as you'd imagine, some spurious concepty add-ons. Also included are a pair of electric scooters housed under a transparent tailgate, a camera-based proactive collision warning feature, and the interior can be pre-warmed on a cold morning so it's all toasty and warm when you go to drive it. But still, look at it. This is definitely a vision of the future we like.